Craft brewers work hard to keep their beer - and business - cool under the pressure of this intense industry. Here are four coverage options which will help protect your craft brewery through it all. Ontarians love their craft beer. That's a fact! We are often found in small breweries on the weekends, jumping at the opportunity to try the newest flavor creations. Consumers are very drawn to spending money within their local economy. 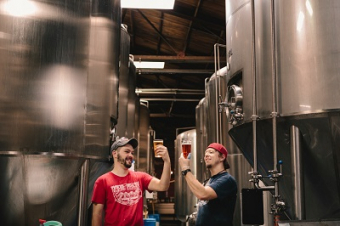 Local breweries can also nurture a sense of pride in their communities. There are almost 250 registered craft breweries in Ontario (CTV News, 2018). It is a very competitive industry. As a brewery, it is your job to keep the cans filled, the taproom bumping and the customers coming back. Unfortunately, mishaps and accidents happen, and you may not be aware of all the specialized coverage options available to you. Fortunately, we have you covered! Here are four coverage options that you may not know are available to you but are necessary to protect your business. Are you constantly traveling around to beer fests, summer festivals and trade shows? An Exhibition Floater will cover the equipment and supplies that you bring to and from the show. If these items are lost, stolen or damaged, this coverage will protect you from the cost of replacing them. In Canada, an excise tax must be paid when your products are delivered to the buyer. All craft breweries must have an Excise Bond. This ensures that you are able to pay the duties and conform to the regulations set out by the Canadian Revenue Agency and the Excise Act. Claims happen. That’s exactly why you carry insurance. Large claims have the potential to shut down your production line and/or taproom service. Business Interruption coverage protects you from the ramifications of a shut down and helps to keep you operational while the details of your claim are being sorted out. We live in Ontario, where severe storms can happen quickly. A power outage, damage to your processing facility or manufacturing equipment can cause costly losses of beer and other supplies. Stock Contamination and Spoilage Coverage can protect you from costly losses associated with spoiled inventory. We are counting on you to keep the cold ones pouring! Connect with Chris Tower, our expert on craft brewery businesses, to see if you are being properly protected and talk about your coverage options. Is Your Craft Brewery Business Covered Properly? If you don't know the answer to this question, it's probably a good idea to talk to our commercial insurance experts. We can help you evaluate what coverage is right for your business now – and what you need to think about as your business grows.